The statistics are staggering. Almost half of Australians (48%) wake up with heel, arch or foot pain at least once a week and an alarming 6 per cent of those surveyed said they experienced the condition every day. Lifestyle factors were also a contributor to foot conditions. Around half of respondents reported having sore feet after work (51%) and after exercise (53%) in the past 12 months alone. According to the findings of the survey, heel or arch pain was the most common foot condition Australians experienced with 48 per cent experiencing it at least once in their lifetime and 35 per cent experiencing it just the past 12 months. Despite the high incidence of these common foot conditions, 58 per cent of respondents had never visited a podiatrist for specialist treatment or advice and just 14 per cent had done so in the past year. My FootDr co-founder and CEO Darren Stewart says the report revealed a clear information gap among Australians about the importance of podiatry in foot health. “Most foot conditions are preventable, but they are being ignored because there is a distinct lack of awareness around proper care of feet and knowing who to turn to for professional advice,” Mr Stewart says. Just 11 per cent of people surveyed said they would visit a podiatrist if they were to experience a foot condition, with 80 per cent indicating they would first turn to their GP. Mr Stewart said better education was needed around how podiatry contributes to overall health and wellbeing. “Podiatry is the only health profession entirely devoted to the study, diagnosis, and treatment of disorders of the foot, ankle and lower extremity,” he says. “We offer a full scope of services including comprehensive foot assessments, gait analysis, foot orthotics and surgery with an emphasis on advising on changes that prevent long-term problems. When it comes to buying shoes, fortunately, 55 per cent of people said comfort and fit was the most important purchasing factor. Despite this, almost the same number (51%) had also forgone a shoe that fits properly in aid of style or price. Women were the biggest offenders with almost two-thirds (64%) indicating they had bought shoes for fashion over foot health. “Many of the foot conditions relating to women are directly linked to their footwear choices – such as wearing high heels – and the associated change in pressure under their feet, in particular the heel and forefoot area,” Mr Stewart says. Mr Stewart hoped the report would help to educate Australians about the importance of adopting a wellness and preventative approach to foot health. “People often wait for a problem to occur, but they should be putting their wellness first by having an annual check-up at their podiatrist – much like a regular trip to your dentist for your teeth,” he says. “A simple change in style of shoe, or a prescription orthotic shoe insert, is sometimes all that is needed to avoid short-term or permanent damage. 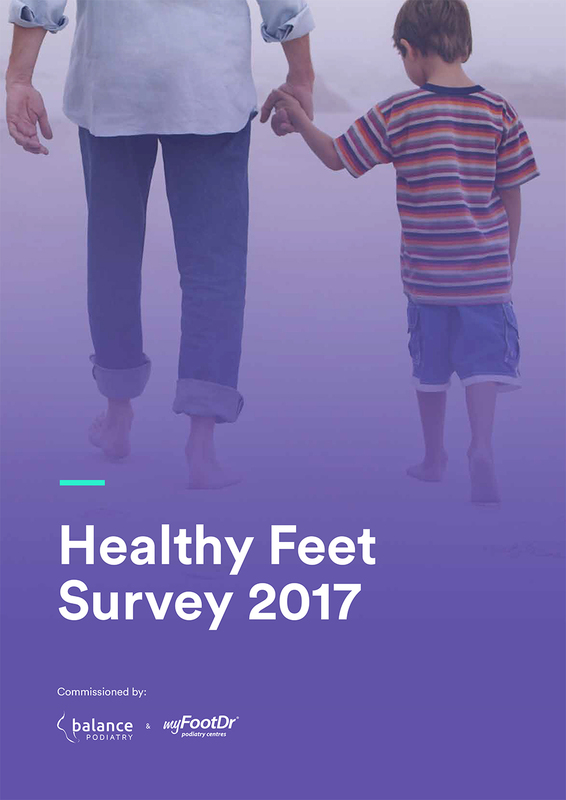 The inaugural 2017 Healthy Foot Survey was co-commissioned by Australia’s leading podiatry groups, My FootDr and Balance Podiatry, to seek to identify and address Australia’s problem with maintaining healthy feet. The survey, undertaken by Pureprofile in April 2017, included 500 respondents aged 30 to 65 from across Australia. Read the full report below.